Have you ever walked into an environment feeling awkward because you were not familiar with the social norms? Hierarchy. Our lives, and society, are often structured around hierarchies. Some of the hierarchies around us are benign. A little over a year ago, I entered Dartmouth’s not-yet-freezing campus a bright-eyed and bushy tailed NARP (Non-Athletic Regular Person). I soon noticed the omnipresence of varsity gear at Dartmouth: black backpacks with telltale stitched green player numbers, Peak Performance shirts and Dartmouth green attire that punctuate the wardrobe of 913 students this year. Last winter, I found the Boxing Conditioning Club (shameless plug). As of this fall, I am one of four co-captains. Ninety percent of Dartmouth students begin their four years bundled with a group of their soon-to-be classmates, camping in the woods, hiking amidst pleasant conversations, trying their hand at canoeing or making pizza at the Organic Farm. 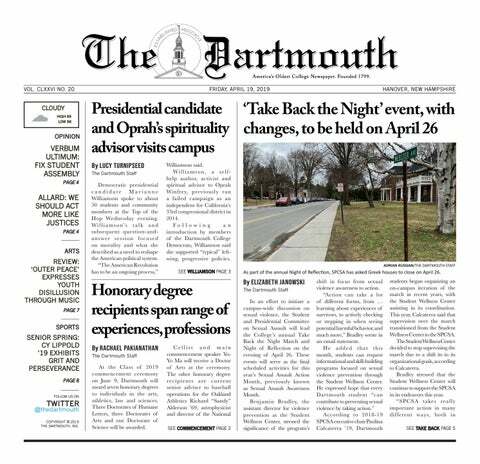 Dartmouth Dining Services is known to students for holding a monopoly over dining options on campus. Leadership is a broad term, but it’s something that many people strive toward. Often times, the type of leadership that people gravitate toward is the kind that comes with a title, and we are often misled to think that the only significant leaders are those who head an organization or have a formal title to their name. Evolution. It’s the reason why we’re here. It’s why we stand on two legs, why most of us get our wisdom teeth taken out, why we have five fingers to clasp our morning coffee. Ryan Calsbeek is a professor in the department of biological sciences. He specializes in natural selection and studies evolution in reptiles and amphibians. Every September, over 1,000 first-year students come to Dartmouth. For many, the College provides an outlet to experience new things. At work this summer, I was asked to write a card to a client’s daughter. She was about to start her freshman year of college. Peter Orner is a new professor in the department of English and creative writing. Orner has authored acclaimed story collections and novels and edited various oral histories over the past two decades. If you are not struck by love upon your first step on the Green, first Collis smoothie or first run around Pine Park — no fear. Welcome back to campus, Dartmouth! From the hints of orange, yellow and red on the trees to the crispness and coolness of the air, it is evident that 18F is finally upon us.